The RakeTheRake sponsored English Poker Open 2012 offers a guaranteed prize pool of £250,000 and takes place in the terrific Fox Poker Club, London between 18th and 21st September. And of course the chance to see all the excitement of the English Poker Open 2012 final day live and up close! If you want to be in with a chance of winning those tickets for you and a guest, then simply head on over to the English Poker Open facebook page, ‘Like’ the page, find the above picture and ‘Like’ and ‘Share’. When you’ve done all of those, your name will be added to a list – from which a winner will be picked at the end of the month. This offer closes on Friday 31st August, and the winners will be announced the following week. 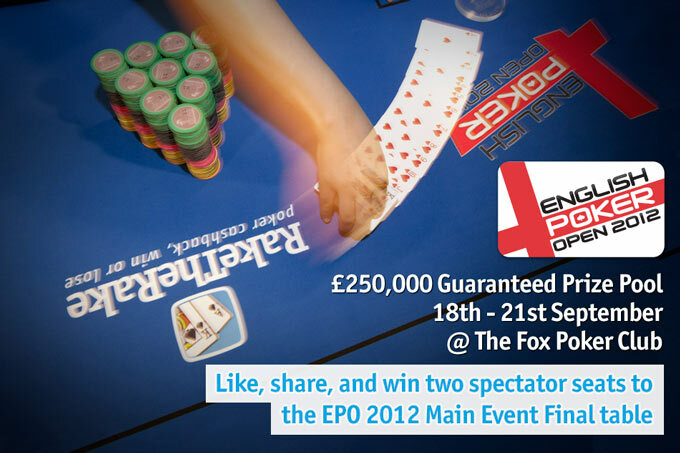 Home » Rakeback News » Win 2 Tickets to the EPO Main Event Final!